Dance with Clouds, Book 2 of A Dragon’s Guide to Destiny, will be on sale for $.99 from Dec. 26 to January 15. Even if you haven’t yet read the prequel, The Snake Charmer’s Daughter, and Book 1, The Dragon Who Didn’t Fly, you can take advantage of this tine-limited offer to pick up Book 2. It will be there when you’re ready to read it. 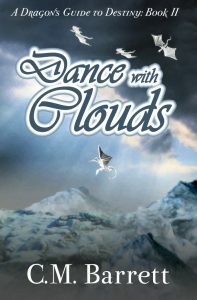 Dance with Clouds will also be part of a special $.99 sale that a number of science fiction and fantasy authors are offering. Get more information at http://pattyjansen.com/promo/end-of-year-2017-99c-promo/. Previous Previous post: Are You Looking for a New World?